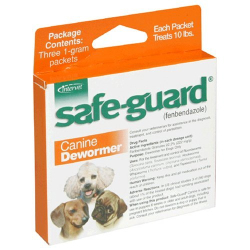 Eliminate worms in your dog - fast and easy - with a convenient dewormer you pour directly on your dog's food 3 days in a row, at least once every 6 months. Safe for puppies at least 6 weeks old, adult dog,s and even pregnant females. Recommended for the removal of Roundworms ( Toxocara canis , Toxascaris leonina ), Hookworms ( Ancylostoma caninum , Uncinaria stenocephala ) Whipworms ( Trichuris vulpis ) and Tapeworms ( Taenia pisiformis ).